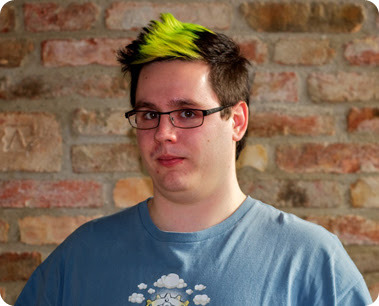 Another brave attempt to temper paugh, this time by placing a lime-green stripe in the center of his hair. Often non-paugh details that might have balanced out the paugh elements in fact accentuate paugh because of its lack of commitment. It's like bright, tasteless icing on a paugh cake. It merely calls attention to the mass of paugh underneath. I'm pretty sure this young man is merely pausing for the camera before his mouth droops and his breath releases into a long breathy "pppaaauuuggghhh" right before he collapses.